The Drexel University men’s and women’s swimming and diving teams traveled to Towson, Maryland to compete against the Towson University Tigers Jan. 12. The men had an exciting meet as they beat Towson 161-133. The women, however, did not place as well in some of the events as their previous meet against Northeastern University and the University of Delaware Jan. 5, which led to a loss to Towson 169-127. The meet began with the men’s and women’s 200-yard medley relays. The women had a great race, leading from off the starting block to the wall at the finish. The team included junior Alexa Kutch, sophomore Gabrielle Rudy, junior Hollie Hopf and sophomore Victoria Palochik. They swam a winning time of 1:45.85 which was 0.33 ahead of Towson. The men’s team took second and third place. The second-place team, which included seniors Alberto Lagrutta Saenz and Ralph Cannarozzi III, and freshmen Paris Raptis and John Scully, were about three seconds behind Towson. Freshman Jordan Washart took second place in the women’s 1000-yard freestyle earning Drexel four points towards their total. Senior Patrick Cobb had a commanding finish in the men’s 1000-yard free finishing over 14 seconds ahead of second place. In the 200-yard free events, junior Dora Gercsak placed third for the women while junior Stathis Malamis finished first for the men only 0.1 seconds ahead of Towson’s Ryan Baldino. The women earned 13 points in the 100-yard backstroke after a one-two finish from Kutch and junior Alicia Diaz. The men followed suit in the same one-two fashion with junior Jason Arthur taking his first win in the 100-yard back and sophomore Kiran Richardson coming in behind. In the 100-yard breaststroke, Rudy took second place for the women followed by freshman Megan Sicinski in third. This was a battle between Rudy and first-place finisher Jacalyn Schoening of Towson. Rudy led the first by less than a 10th of a second after the first lap, but ultimately fell behind coming to the finish. Cannarozzi took first place for the men’s team with a time of 57.53. During the women’s 200-yard butterfly, the field was very tight for the first two laps, but the third lap saw Towson’s Megan Cowan pull slightly ahead of the other swimmers. Drexel senior April Forsthoffer was just ahead in second heading into the final lap and swam the fastest split of the others to hold her second-place position. Raptis took second for the men just over two seconds behind first-place. It was an intense race for the 50-yard freestyle, as less than a second separated the top three finishers for the women’s and men’s events. Hopf swam to third place for the women and Richardson and Scully took second and third for the men. For the women’s 1-meter dive, freshman Hannah Jordan placed third. Then, in the men’s 1-meter dive, junior Anthony Musciano was narrowly beaten by Towson’s Will Canny 277.65-276.90. In the men’s 100-yard free, Malamas placed second for the men with a time of 46.03 which was 0.61 seconds behind first-place Matthew Essing. Kutch won the women’s 200-yard back with over a one-second lead. Diaz came in third behind Towson’s Meghan Jones. Arthur swam to another strong finish in the men’s 200-yard back with a three-second lead over Towson’s Zach Bishop. The men swept the top three places in the 200-yard breast. Senior Joseph Brown came in first as he took the lead right from the start. Sophomore Zachary Valenzuela was behind him in second place and Cannarozzi was in third. The women took second and third place in the 200-yard breast with Sicinski in second just 0.57 behind Towson’s Schoening. When it came time for the 500-yard free events, Towson’s Sarah-Margaret Locke won by over four seconds. Gercsak came in second for Drexel. Cobb won the men’s 500-yard free by exactly three seconds, ahead of Towson’s Evan Brophy. Drexel senior Dane Bell came in third behind Brophy. In the women’s 100-yard butterfly, senior Charlotte Myers and Forsthoffer came in second and third, respectively. The winning time of 56.64 was from Towson’s Maddi Mangum. Myers touched the wall at 57.78 and Forsthoffer at 58.48. In the men’s 100-yard butterfly, Raptis came in second to Towson’s Jack Saunderson. Back to the diving boards, Towson came away with the victory for the women’s 3-meter dive and a solid lead over the Dragons. Only this score counted for Towson, while the three Dragons competing all received points towards the team total. The competing divers were freshmen Becca Demaree, Hannah Jordan and Katie Caputo. In the men’s 3-meter dive, Musciano lost to Towson’s Canny 310.85-290.48. Rounding out the competition with the individual medleys and final freestyle relays, the Towson women and the Drexel men were ahead in points against their competitors. Some times were eliminated from the scoring. Even such, Rudy, Sicinski and Forsthoffer were able to earn nine points in the women’s 200-yard IM with second, third and fourth place finishes, respectively. Arthur and Raptis swam to first and third place in the men’s 200-yard IM. Arthur was named Colonial Athletic Association Swimmer of the Week for his three first-place finishes at this meet. In the women’s 400-yard free relay, the Dragons’ times would have put them solidly in second and third place, but they were able to take the top two spots as the Towson times did not count. 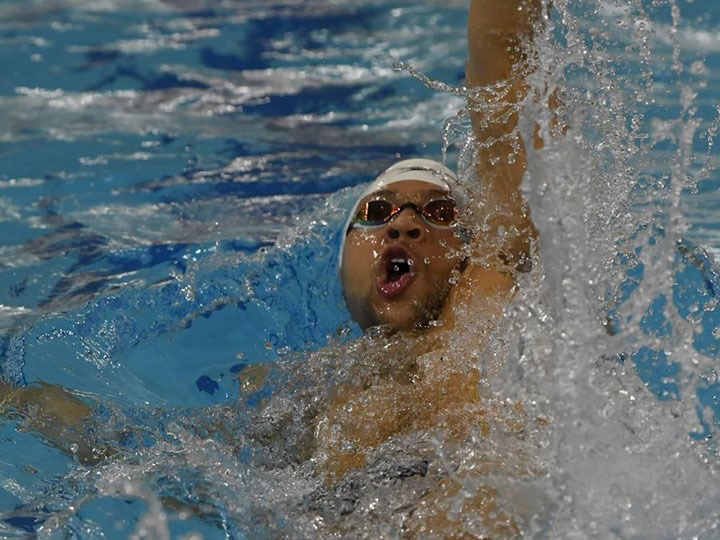 In the men’s 400-yard free relay, the Drexel teams took first and third place. The swimming and diving teams have their final home meet Jan. 19 against Georgetown University. This will be the seniors’ last home meet of their careers. The teams will have a month to prepare for the 2019 CAA Swimming & Diving Championships in Christiansburg, Virginia, Feb. 20-23 where they will be seeing Towson, Northeastern and Delaware again.